UPGRADE to Priority Shipping with the United State Post Service, which typically arrives within 1-3 days, when ordered before 3 pm on a weekday. This delivery option is very typical, however, it is not guaranteed. This fee is in addition to the shipping fee associated with your items. 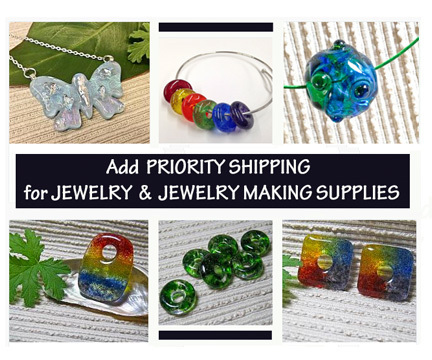 When shipping Jewelry & Beads, I can generally fit 5 items into the box while still wrapping them securely. *If you prefer a guaranteed delivery date I can ship with USPS Priority Express. Contact me for pricing, which depends on weight & location. ALL OF MY CREATIONS ARE ORIGINAL DESIGNS and are individually hand-crafted by me. The handmade quality and creativity are what set my work apart from mass-produced products. Color, size, and texture variations contribute to the uniqueness of each piece. *Insurance is included with shipping fees.